Pristine snowcapped peaks of the Rocky Mountains tower like sentinels over the sprawling tawny plains below dotted with shrubby vegetation that transition into arid buttes and badlands to the northeast and beyond. Puffy white clouds drift lazily across the famed big, blue skies high above the rolling meadows adorned with native wildflowers and sweet white clovers. Remote, wild and vast, these wide-open spaces and diverse terrain are what truly distinguish the state of Montana. Small white clover blossoms comprised of globes of dainty narrow petal spikes, often tinged pink or cream, spring up like cheerful little pompons amid lush green mats of lobed leaflets. Aside from its charming appearance and light pleasant scent, the wonderful value of this flower is that it can grow well in poor soils and provides an abundant supply of nectar with its extended bloom period making it a reliable floral source. Honey bees eagerly harvest nectar from these delightful blossoms which is used to produce GloryBee’s Raw Montana White Clover Blossom Honey. This 100% pure, raw honey is not only regionally sourced from Montana, but is also sustainable and supports SAVE the BEE®. 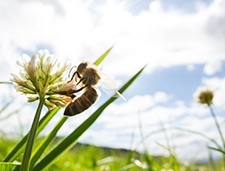 We're proud to bring you a raw honey that meets European standards for bee pollen content. Because of the unique way our honey is handled, it retains the bee pollen, enzymes, and other micronutrients generally lost during processing. Our raw honey is never heated over 115 degrees F and is only strained, never filtered. A portion of sales from this honey is donated to SAVE the BEE® which helps support honey bee research and the issue of colony collapse disorder (CCD). Certified kosher and gluten-free, GloryBee's Raw Montana White Clover Blossom Honey is honey you can feel good about eating and sharing with your friends and family. Many consider clover honey to be the standard by which all other honeys are measured. With the mild, sweet flavor like a sugary confection it is easy to see why Raw Montana White Clover Blossom Honey is one of our most popular varietals. The color ranges from white to light amber. The texture is thick and creamy with a distinctive Montana richness. The subtle pleasant aroma imbues a lovely brightness when added to your favorite treats. For a deliciously luxurious experience, spread this velvety white clover honey over roasted figs with ricotta cheese on toasted bread, drizzle it over crepes topped with juicy mixed berries, or add a golden dollop to nutty overnight oats.